The Ocean Modeling Forum (OMF), in collaboration with Fisheries and Oceans Canada, convened a Pacific Herring Summit from June 8-10, 2015, Richmond, British Columbia. Over 115 people from along the west coast of North America attended the Summit, including representatives from 14 First Nations/Tribes; 5 federal, state and provincial agencies; 11 academic institutions; 5 NGOs; and 4 fishing industry organizations. The Summit served as the launch of the OMF’s Pacific Herring Working Group which will focus on incorporating dimensions of human wellbeing and traditional knowledge into formal herring fishery assessments. That working group will conduct the technical work of comparing multiple models and evaluating the role of Pacific herring in the social-ecological system, and asking how human dimensions can be included in management. The Herring Working Group will meet in a series of workshops over 1-2 years, beginning in early 2016. The Pacific Herring Summit convened modelers, technical experts, managers, representatives from Canadian First Nations and United States Tribes, and key stakeholders from the West Coast of North America (California to Alaska) to launch the OMF Pacific Herring Working Group, and to inform the OMF working group efforts. direct the efforts of the OMF Working Group. The Summit was opened with a welcome by Mr. Larry Grant, an Elder from the Musqueam First Nation in Vancouver, BC. Following Mr. Grant’s welcome were presentations by representatives of Canadian First Nations and United States Native American tribes, offering their perspectives on cultural, ecological, and economic connections to herring , and on changing herring populations. These presentations were recorded graphically by Sam Bradd, resulting in stunning images that were displayed in the meeting room to provide context and content for the remainder of the Summit. Those images are available for viewing here. Presentations on the second day of the Summit addressed the role of herring in the social-ecological system, including oceanographic influences on herring, the role of herring in the food web, relationships between herring and human wellbeing, the spatial structure of herring populations, and archaeological perspectives on herring abundance and distribution. All told, during the Summit there were presentations by 22 experts, offering presentations related to the social, ecological, and economic role herring play along the west coast of North America. Presentations from the Summit are viewable here. A series of four small group discussion sessions was held during the Summit, focused on both individual components of the herring social-ecological system and the system as a whole. Participants were aggregated into 13 pre-assigned groups of 8-9 people, each with an appointed discussion facilitator and note taker, to jointly respond to a series of questions posed by the Summit organizers. The group membership varied over the 4 discussion sessions, so that the knowledge shared was neither always the result of a shared belief system among common backgrounds, nor limited by any restrictions felt in mixed-background groups. Groups shared the results from their discussions after each discussion session. The final Summit agenda is available here. A final list of Summit attendees is available here. recommended next steps in developing the full OMF case study. 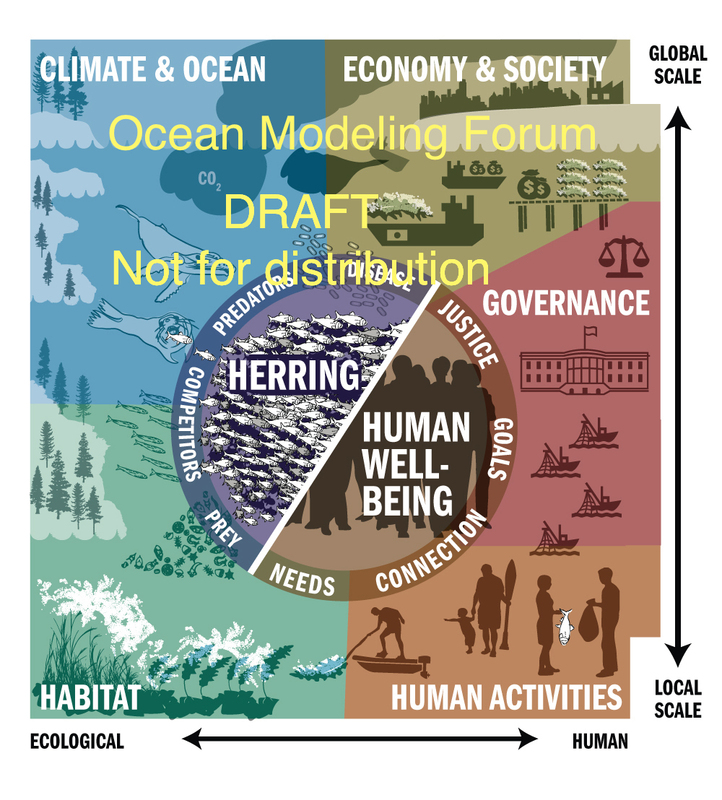 The Summit organizers are presently drafting a manuscript for publication that presents the conceptual model of the herring social-ecological system constructed using data collected during the Summit. A final list of Summit attendees. The Sam Bradd graphic recording images. The OMF is presently forming its Pacific Herring Working Group, which will focus on incorporating dimensions of human wellbeing and traditional knowledge into formal herring fishery assessments. 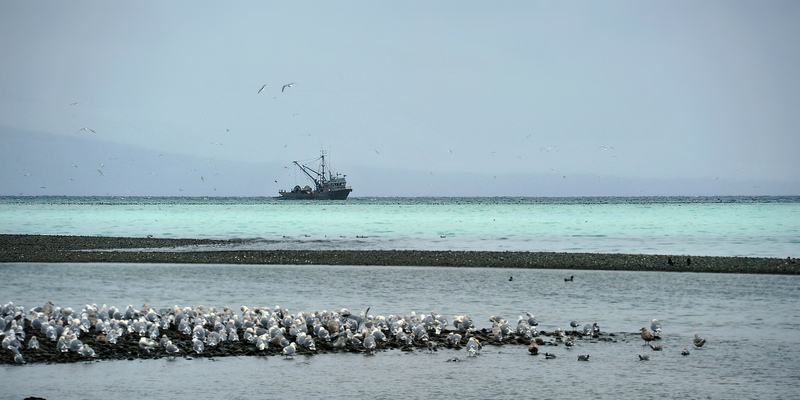 The working group will conduct the technical work of comparing multiple models and evaluating the role of Pacific herring in the social-ecological system, and asking how human dimensions can be included in management. The Herring Working Group will meet in a series of workshops over the next 1-2 years, beginning in early 2016. Questions can be addressed to tessa at uw dot edu. The Pacific Herring Summit was convened as the result of generous funding from the Pew Charitable Trusts and the David and Lucile Packard Foundation.